It can be very disconcerting to hear your cat retching, knowing that there is nothing you can do to help. Well, as you probably know, cats spend a lot of time grooming themselves and while doing so ingest small amounts of fur. Sometimes it passes through the intestinal tract, but at other times there is too much of it and it ends up being vomited out. There is nothing pretty about this. Just think about your drain after you’ve washed your hair a few times. Sorry for the visual, but it’s a hard fact. Hairballs are not nice and it’s even less pleasant for your cats than for you. 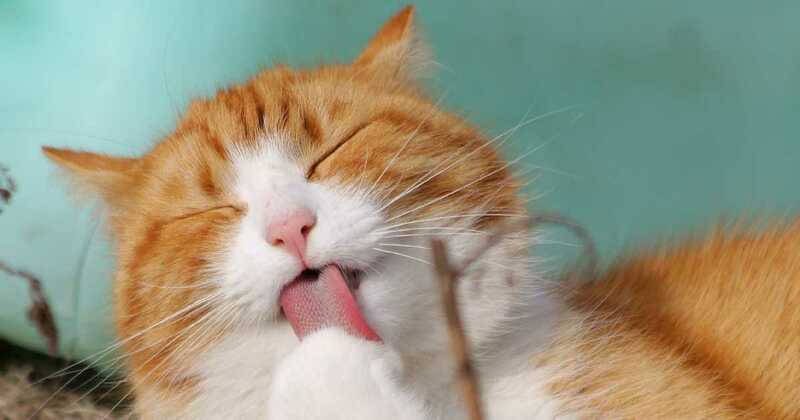 Sometimes cats groom themselves excessively when they are stressed or bored. You should provide them with toys or catnip, and a cat tree is a great idea. They will have great fun scratching the posts and jumping up and down it. If you put one near the window they will be able to stare out at the birds and other animals, and perhaps not groom so much. You don’t like to see your cats having this problem so there must be something you can do for hairball prevention? Keep reading to find out what we think you should do to reduce the frequency of hairballs. What to do with a cat who has hairballs? So, what can you do to help your cats? Brushing your cats more often can get rid of dead and loose hair, and this goes for both long haired and short haired cats. Yes, even short haired cats can get hairballs, although it is more common in long haired cats. Brushing your cats daily can also stop them from getting matted hair which will be very uncomfortable for them. In addition, this extra contact with your cats should create a stronger bond between the two of you, so it’s win win all the way. Funny though it sounds, some cats even like being vacuumed with a small cleaner. If you are looking for another efficient hairball remedy the answer is simple. Change the diet of your cats. There are anti-fur ball cat foods out there which are made specifically to stop or at least reduce hairballs. It seems strange that a special diet can reduce the impact of hairballs, so how can a cat food actually do this? Well, to start with, these foods are filled with a lot of dietary fiber. Fiber helps to move food through the digestive system quickly and efficiently. If your cat has ingested some hairs, they will also pass through the digestive system before they have time to turn into hairballs. A grain-free diet is also recommended. Wheat, corn, and soy are just empty fillers and have no nutritional goodness. 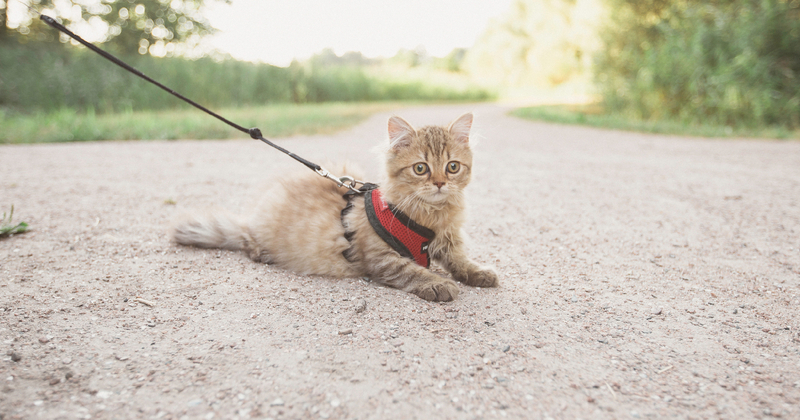 In addition, some cats are allergic to grains and have trouble digesting them, making it more difficult for the hairs to pass through the system. 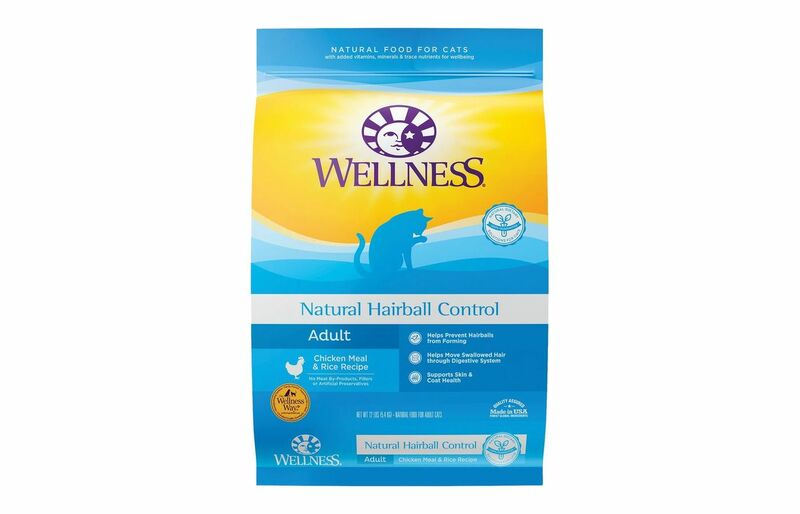 Also worth mentioning is that a hairball control cat food should contain plenty of fruits and vegetables. These are filled with antioxidants which help to improve the skin and coat of your cats so reducing the amount of hair they ingest. 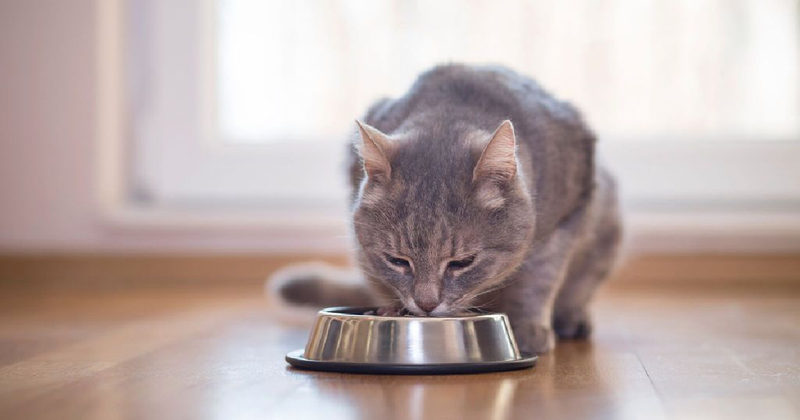 Don’t buy a cat food with artificial flavors, colors, or preservatives as they will do nothing to help your cats and in the long run could harm them. You should check the ingredients carefully on the tins of cat food before you buy them. If there are meat by-products, starches, and gluten in them, leave them on the shelf. Wheat gluten sounds like it should be healthy, but it’s not. Sometimes it has melamine in it which can cause kidney failure. This is definitely worth avoiding because cats, as they age, are prone to develop kidney problems. A final choice is to give your cats hairball laxatives which will help flush the hair out through the digestive tract. However, you should ask your vet’s advice about this and give small doses as you don’t want nasty accidents happening. If you don’t want to use a laxative, try adding a teaspoon of pumpkin puree to your cat’s food. It has masses of fiber and should do the trick. 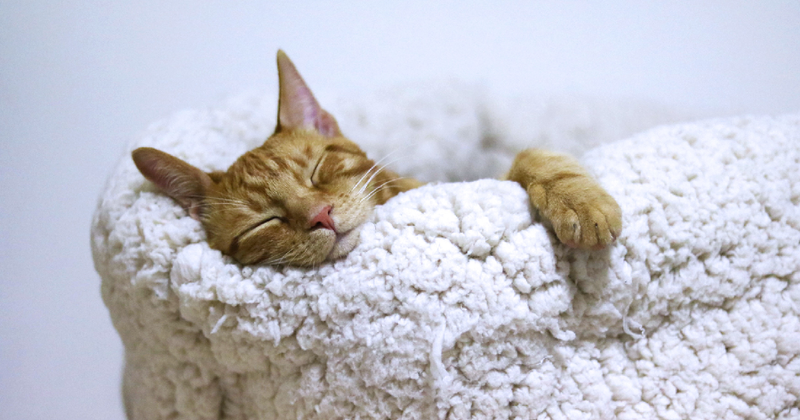 A teaspoon of olive oil now and again can smooth your cat’s digestion process. Just remember not to give them olive oil directly into their mouths as it could get in to the lungs. Mixing it with their food should work a treat. How do you know if your cat has a hairball? It can be difficult sometimes to know if your cats actually have hairballs, or if they are just being sick. The thing to do, although it might not be very nice, is to inspect the vomit. A hairball will be an elongated bunch of cat hair covered in yellow and green bile. There are other signs you can look for, such as retching without bringing anything up and loss of appetite. If they are more tired than usual this could also be a sign of a hairball. In addition they could be constipated or going to the opposite end of the spectrum, they could have diarrhea. Of course, these signs could point to any number of other illnesses, like a sensitive stomach, and you may have to pay a visit to the vet if you are worried. If your cat starts to bring up more hairballs than usual, you should definitely see your vet. There could be an underlying illness such as irritable bowel syndrome. If this is an issue, your vet will prescribe other special foods. How to choose a suitable cat food for hairballs? Cats are carnivores. They need meat to survive, so when looking for a suitable hairball control food, make sure that it has a high percentage of animal protein. Protein helps to give your cats stronger and healthier skin and hair which minimizes shedding. Certain amino acids which cats need can only be found in animal protein so this is another reason to choose an anti-fur ball cat food. In addition your cats need some healthy fats, and dietary fiber, but only small amounts of carbohydrates. The probiotics and prebiotics in the food help to improve digestion, and so allowing the strands of hair to pass through easily. The next thing to think about is will my cats like the food? There is no point buying special food for your cats if they won’t eat it. Luckily there are different flavors and brands out there, although they are mainly based around poultry and fish. You may have to try out different brands on your cats to see if they like it. Buy small bags of dry hairball control cat food so there won’t be too much wastage if your cats don’t like the food. It is easier with canned cat food as they can be bought in small 3 ounce tins. If your cat has always preferred dry food, it is best to stick with this when changing their brand. It is always a good idea to start introducing the food gradually until you are serving only the hairball control food. This way they get a chance to get used to their new diet. What to do if your cat can’t bring up a hairball? There may come a time when your cat continues retching, but nothing comes out. This is time to take action as the hairball could be stuck in the intestinal tract. There is usually no way to remove it without surgery so get your vet’s as soon as you can. So you’ve read our article and hopefully aren’t too overwhelmed by the effect of hairballs. Here we want to give you a summary of what we have advised for reducing the effect that hairballs have on your cats. Start to groom your cats on a daily basis, whether or not they are short or long haired. Brushing them yourselves can get rid of unwanted cat hair which they might instead swallow. Change their diet to an anti-fur ball cat food which will help with their digestion. Make sure that their new diet contains plenty of dietary fiber which will help the hairs go through the intestinal tract together with their food. Food high in animal protein is recommended as cats are carnivores. As protein is good for a healthy skin and coat, it will minimize shedding. Choose a food which has a low carbohydrate content. Many cats have a problem digesting carbs which can affect the smoothness of their digestion. Avoid meat by-products as they have little nutritional value. Too much of this means a lower protein count which leads to lank and falling out hair. If your cats have trouble bringing up a fur ball, head off to the vet because if it is stuck, your cat will probably need emergency surgery. Now that we have told you about what to do with hairballs, it’s time to give you our top ten anti-fur ball cat foods which I hope will give you a good idea of what to choose. This is our top choice as it has so many benefits which can reduce the effect of hairballs. Firstly, it is jam-packed with fiber which will help to give your cats healthy digestion. Secondly, it is made with real chicken, a great protein source which will give your cats a shiny coat and healthy skin, so lessening hair fall-out. In addition, Blue Buffalo load their food with Lifesource Bits, which is a special blend of vitamins, minerals, and antioxidants. These combine together to help with immunity against many illnesses. There are omegas for healthy skin and taurine for vision and heart health. The amino acids give your cats plenty of energy to play. The food is also completely grain-free which means that there are more healthy ingredients, all of which help with hairballs. In addition, allergies will be a thing of the past with a grain-free diet. 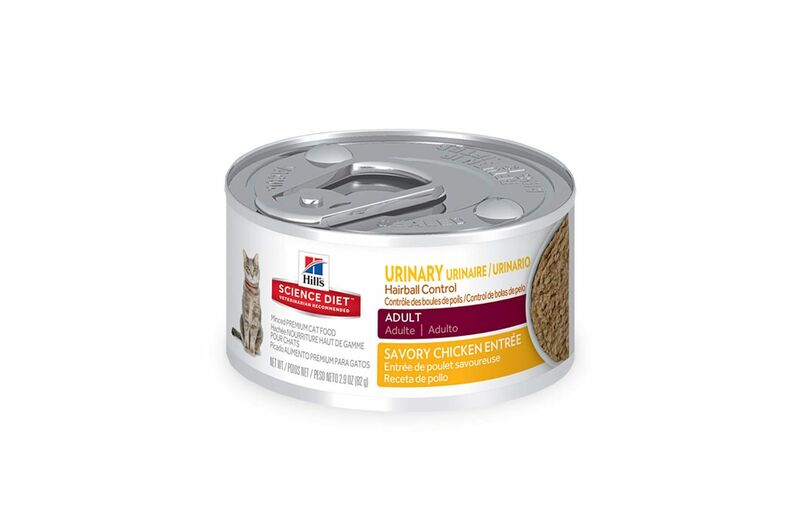 Perhaps your catsprefer wet food to dry, so why not try this Hill’s Science Diet canned food.Just remember that wet food doesn’t have as much protein as dry so it is a goodidea to try out different dry foods on your cats to find one which they like. This canned catfood has double benefits. Firstly, it supports their urinary system byproviding high levels of magnesium. Secondly, it helps to reduce hairballs byhaving optimal levels of fiber which will make it easier for hair to passthrough the digestive system of your cats. This wet food is made completely with natural ingredientsand is jam-packed with vitamins, minerals, and amino acids. It contains noartificial flavors, colors, or preservatives which are completely unnecessaryfor the health of your cats. In addition, it has taurine which helps withvision and heart function. Royal Canin pride themselves on manufacturing tailor made recipes to suit every cat’s needs. This includes special cat food for those cats who suffer from hairballs. This dry food recipe is especially made to reduce hairball formation. It contains a special blend of fibers, including psyillium, seed husk, and insoluble fibers which stimulate the digestive process. It is rich in mucilage which helps to move the hair through the body of your cats instead of leaving it in the stomach to cause hairballs. 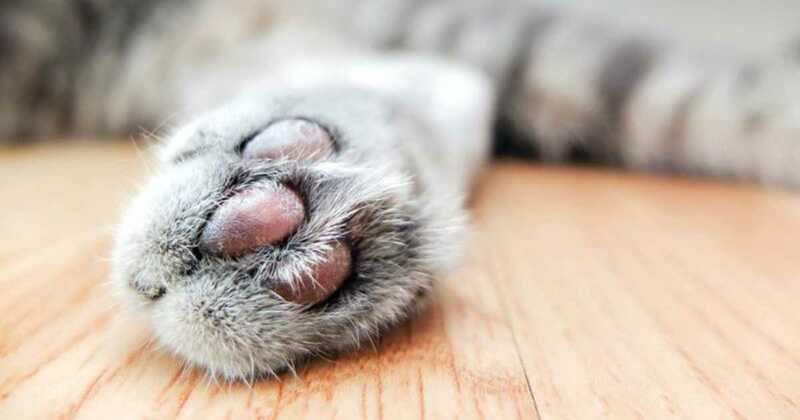 Not only does this cat food help to reduce hairballs, but it also helps to reduce inflammation with a special combination of fatty acids and fibers. 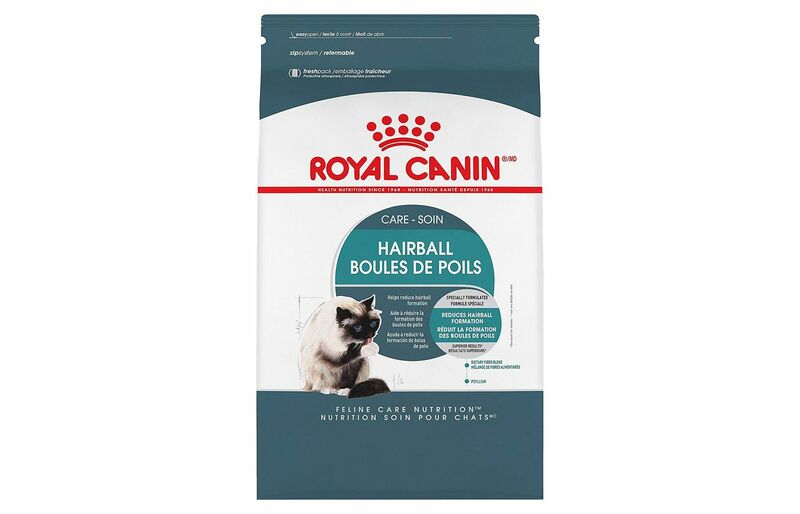 Royal Canin Hairball Care Dry Food is high in protein, so helping to give your cats shiny coats and good skin. In addition, the shape and texture of the kibble helps to reduce the formation of plaque on the teeth. It is always a good idea to start dental care as early as possible with your cats to prevent tooth pain as they get older. 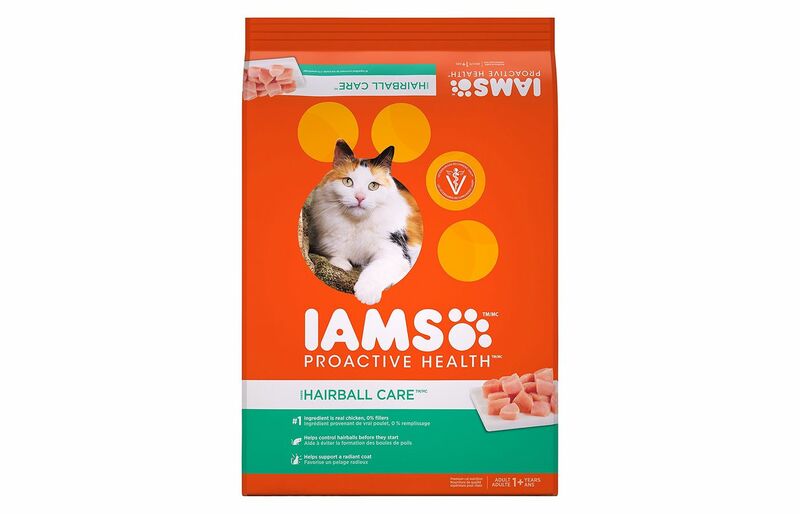 This dry hairball prevention cat food contains a special formula which improves the quality of your cats’ coats and skin, as well as their digestive processes. It is a blend of fibers, including beet pulp and FOS. FOS encourages healthy bacteria in the stomach of your cats. It also increases the ability of your cats to absorb nutrients and to pass food quickly through their digestive system. By doing this it actually helps to eliminate odors from the litter box, as well as eliminating hair. Can’t be bad! In addition, this dry cat food is jam-packed with B vitamins, fish oils, and brewers yeast. This combination helps to give your cats shiny coats and healthy skin which reduces the amount of hair that can be lost. This food also has unsaturated fatty acids which are good for your cats and again help with skin and coat issues, as well a ssupporting brain activity and bone and joint health. This is another dry cat food which has a high content of fiber to help improve digestion and stop hairballs from forming. It’s also high in protein, with chicken as the first ingredient,which helps your cats have healthy skin and a shiny coat. In fact this food has one of the highest levels of protein out there at 38%. All this added together limits hairballs from forming. This dry cat foo dis especially recommended by vets because it is full of vitamins and minerals.It also has taurine for good vision. It contains omega-6 fatty acids, which,like the protein, encourage your cats to have a glossy coat and healthy skin. This hairball remedy also helps to keep your cats teeth clean which is a bonus, and it is easily digestible so again helps to stop hairballs from forming. To top it all, it has been made with no fillers, so your cats can have a grain-free experience. Wheat, corn, and soy are not needed in the diet of your cats as they offer no nutritional benefits. 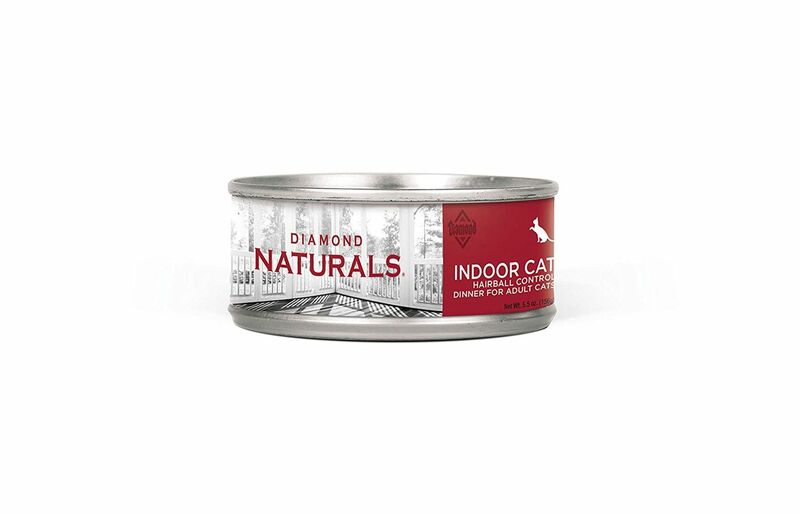 We haven’t had much wet food in this list, so I want to tell you about Diamond Naturals Indoor Hairball Control. It’s jam-packed full of fiber, allowing the digestive system to operate smoothly. It’s also got a reasonable amount of protein in it for a wet cat food, which will help muscles to become lean and strong. There are also omegas-3 and 6 fatty acids which promote healthy skin and a shiny coat. This lessens the chance of hairballs being formed. This isn’t the end of the goodness this hairball prevention cat food has. It’s loaded with vitamins and minerals for overal lhealth and taurine for good vision. As it’s a wet food, there’s plenty of moisture in it so your cats can stay hydrated. It’s packed full of healthy vegetables meaning your cats will get their fill of healthy antioxidants. There are also amino acids in this food which helps to produce healthy and strong muscles. 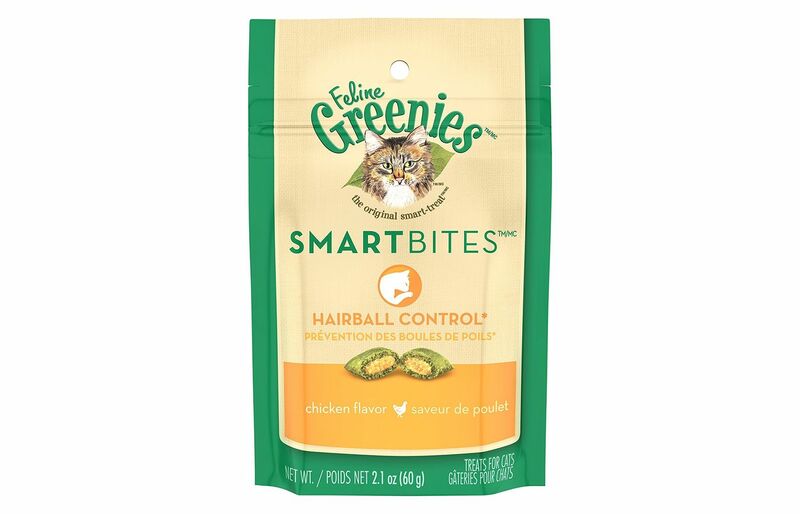 Your cats need a treat every now and then to show them how much you love them, so why not make their day by giving them Greenies Smartbites. They have plenty of plant-based fiber in them to help with hairballs and digestion. To minimize the hairballs it is advisable to feed them twelve treats in one go. 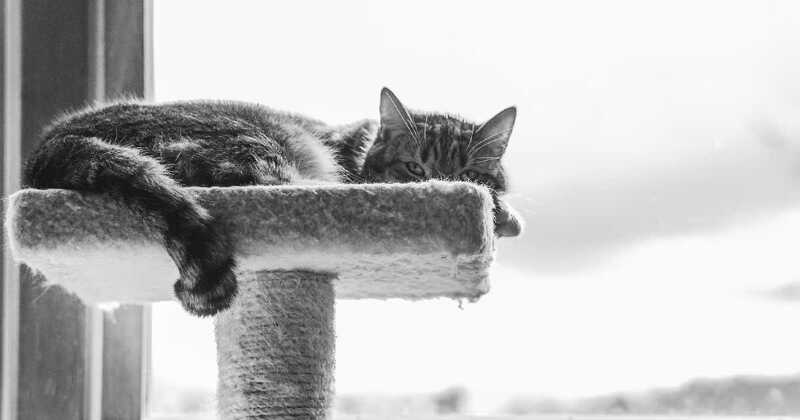 Chicken meal is the first ingredient so your cats will also be getting some protein to help create lean muscles, help with their metabolism, and give them a shiny coat. The treats are also jam-packed full of essential vitamins and minerals. Your cats will love these treats. They are dual textured and have a soft savory center with a crunchy outer layer. The crunch is good for removing plaque from the teeth and it supports overall dental hygiene. Go on, treat your cat today. As well as a snack, they will be getting help for their hairballs. As cats age, they seem to be more prone to getting hairballs, and this dry anti-fur ball cat food is specifically made for older cats, aged seven and above. 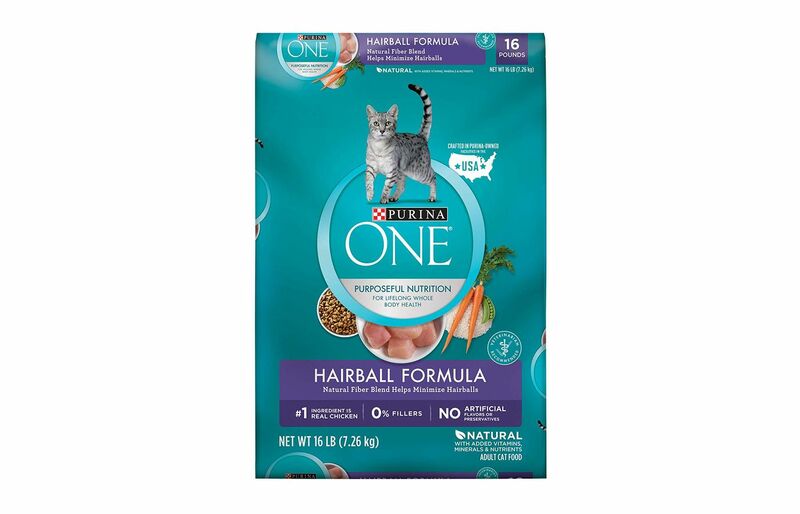 It has a good amount of fiber in it to help with hairballs and it is made with chicken as the first ingredient. This protein encourages overall health, promotes a healthy metabolism and aids muscle development. 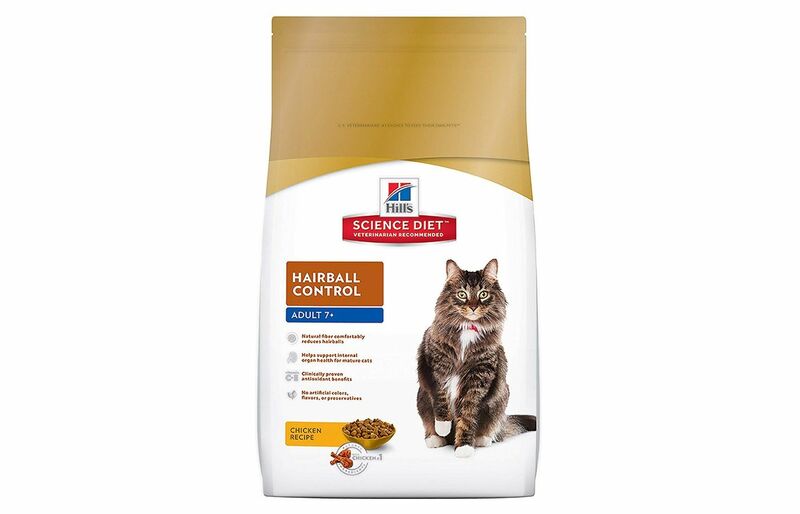 Hill’s Science Diet Hairball Control Dry Cat Food also contains Omega-6 fatty acids and vitamin E,both of which help your cats to get a shiny coat and healthy skin. This reduces the amount of hairs that fall off and your cats ingest. Another great advantage of this cat food is that it is jam-packed full of antioxidants and vitamins. They work together to create a healthy immune system which also helps to reduce shedding. 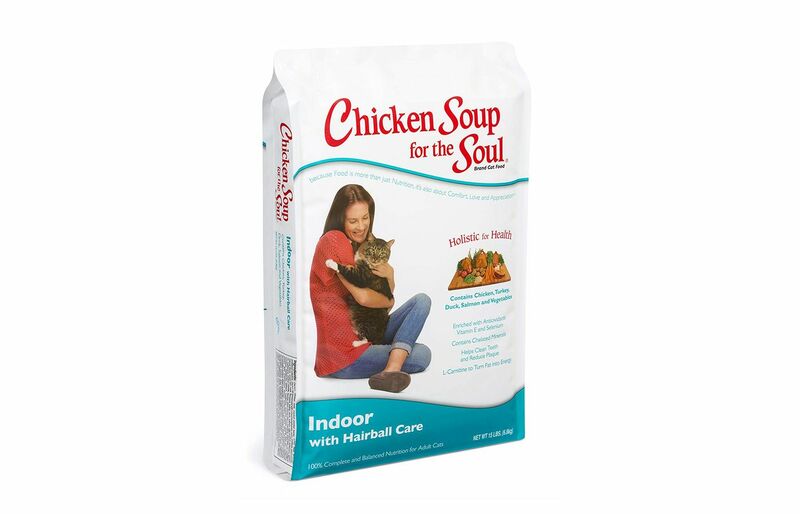 Chicken Soup for the Soul is usually associated with the books they publish, but they have come up with a pet food range as well which is worth trying. This dry cat food has been designed with senior cats in mind; those eleven and over. It has been made to provide good digestion in your senior cat and to reduce or get rid of fur-balls. There is plenty of protein for optimal health. The main ingredient is chicken, but it also contains turkey and salmon. There is plenty of fiber included to get rid of the hairballs and this comes in the form of delicious fruits and vegetables. To top it all, there are plenty of antioxidants in this hairball prevention dry cat food, as well as vitamin E and selenium. Selenium helps to prevent cell damage and build a healthy immune system. 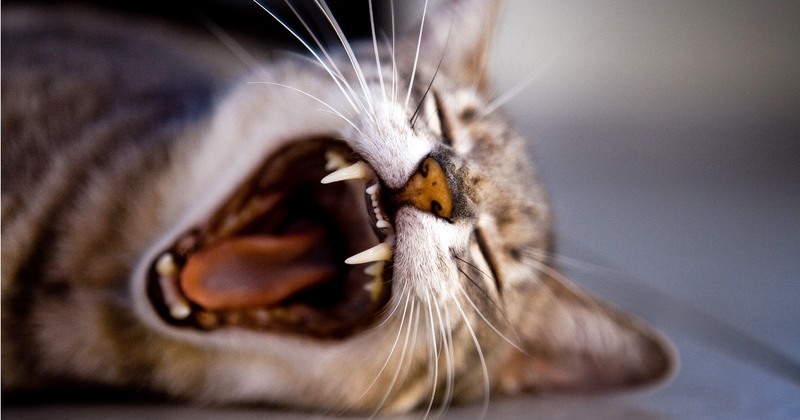 The crunchy kibble helps to clean your cat's’ teeth as well as reduce plaque. 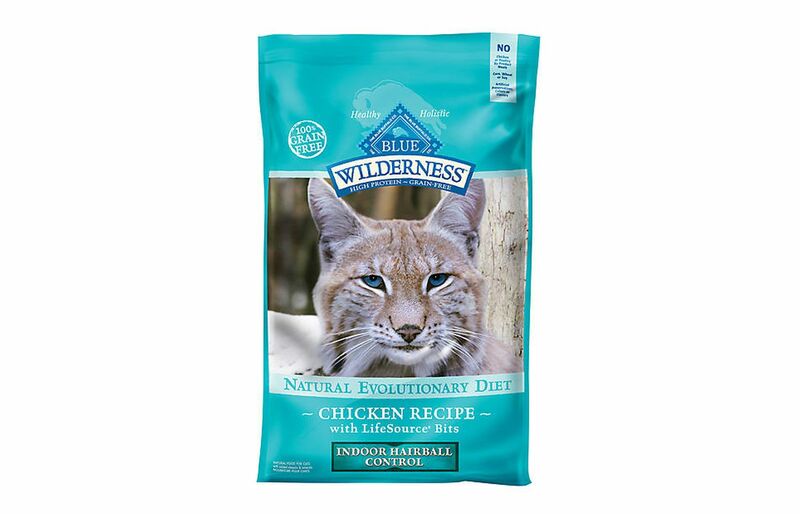 This is a great food to feed to younger cats, that is those over a year old, as it is packed with calories which they need for all that energy they have. In addition it has chicken as the main ingredient.This protein helps to support lean muscle and gives them more energy.Carbohydrates don’t come in the form of fillers like wheat, corn, or soy, but the recipe includes wholesome rice instead. It has plenty of healthy fiber which will help to reduce those nasty hairballs. This anti-fur ball cat food also contains taurine which helps with good digestion in the small intestine and promotes good vision. In addition it is packed full of antioxidants,vitamins and minerals for the overall health of your cats. To help maintain a healthy coat and skin, it has flaxseeds and omega-6 fatty acids. My cat used to love this liter, but hates it now! What changed? During a cat’s life, preferences change. As your feline overlord gets older and slower, make sure to make life easier, and especially using the litter easier. Your cat could also have a health problem that you haven’t noticed yet if she is completely changing her daily patterns. If your cat rejects a litter that used to be fine, try using a more cat-sensitive litter with no added scents and as little dust as possible. If this doesn’t work, switch litter types. Litter is made of natural products like corn or paper, there is also clumping clay and litter crystals on the market. Choose a new material and see how your cat reacts to it. Make the litter box easy to access. If your cat has problems climbing in and out of the litter box, cut the sides lower and don’t forget to sand them so no rough ends hurt you or your pets.